19. Hesed Menachem, a welfare center operated by the American Jewish Joint Distribution Committee, moved into the sixth floor of the Menorah Center in February, 2014, after many years in a two-story former preschool building. The new premises are somewhat smaller than the old school structure, but the Menorah Center is new, does not require clients to climb stairs, and is in the center of Chabad-organized Jewish communal activity in the city. Anatoly Pleskachevsky, director of the hesed, stated that some clients were apprehen-sive about moving to the much larger Menorah Center building, fearing the elevators and worried that they might be unable to navigate among other building users who were younger and moved more quickly and more nimbly. However, Mr. Pleskachevsky said, Menorah Center management has been superb in arranging schedules and assisting any hesed clients who require aid. Mr. Pleskachevsky added that it was good for elderly people to be in a large community building; the presence of other people and the occurrence of many activities add "life" to the perspective of individuals who often are isolated. Security, he noted, was much less complicated in the large Menorah Center, which had its own protective arrangements, than in an isolated building like the old preschool structure. 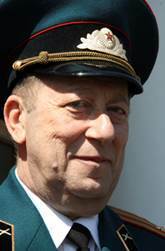 Hesed director Anatoly Pleskachevsky is a 34-year veteran of the Soviet armed forces, having retired as a colonel after serving in the artillery corps in Afghanistan. The hesed currently is serving 6,000 clients, almost all of them elderly Jews, in the city and 45 points in the surrounding region, stated Mr. Pleskachevsky. The client census continues to decline, he observed, down from 7,000 in 2013. The reduction in clientele does not reflect a decline in need, he acknowledged, but a reduction in financial resources available to serve vulnerable Jewish elderly. Further, Mr. Pleskachevsky averred, the ratio of clients eligible to receive services provided by the Conference on Jewish Material Claims against Germany has declined to 40 percent of total clients, an enormous drop from the 85 percent who received Claims Conference funds when he began to work at the hesed 14 years ago. He observed that 18 clients died in March, an unusually large number; perhaps, he mused, they died due to the "situation" in eastern Ukraine, that is, they were frightened that hostilities further east would spread to Dnipropetrovsk and that they would be enveloped in another war (after World War II). Financial aid to needy clients now is transmitted through PrivatBank debit cards, which are recognized almost everywhere in the hesed service area, said Mr. Pleskachevsky. PrivatBank has cash terminals even in small towns, he stated. Outside Dnipro-petrovsk, Mr. Pleskachevsky continued, Dniprodzerzhinsk is the largest hesed base in the area; approximately 400 clients live there. About 280 clients reside in Pavlograd and another fairly large group resides in Novomoskovsk. Other clients live in any of 42 other points, some of them small villages and remnants of Agrojoint farms established by the Joint Distribution Committee in 1924. Some of these very small villages lack dependable electricity, Mr. Pleskachevsky said; 14 people in such locales receive periodic food parcels and medicines because, obviously, bank terminals cannot function without electricity and/or there may be no accessible retail outlets in which to purchase supplies. Hesed Menachem manages a "hesed on wheels" that operates 20 different periodic routes to deliver medicines to specific clients and to conduct assessments of local situations. The hesed also distributes health care apparatus and implements, such as wheelchairs, walkers, therapeutic mattresses, and other items that are too expensive for many clients to access through conventional retail outlets. Due to space limitations, this service is administered from a large utility closet on the same floor as the hesed that serves unofficially as warehouse space. The hesed provides patronage or homecare services (cleaning, cooking, shopping) to about 800 homebound clients, stated Mr. Pleskachevsky. Approximately 200 homecare workers are employed in this endeavor. Mr. Pleskachevsky said that this homecare team is very stable; pay is low, but salaries are paid on time. Asked about inflation, Mr. Pleskachevsky said that it is severe and that the hesed monitors the cost of living on a daily basis. It used to fix prices with suppliers at the beginning of the year, but now vendors are reluctant to set prices even on a monthly basis. The prices of specific medicines may increase two or three times every day, he stated, because most are imported and subject to heavy import taxes and other fees. The cost of locally grown vegetables and certain other foods are relatively stable, but any items transported over significant distances have increased markedly in cost because fuel prices have escalated sharply. Citing a specific economic burden for the hesed, Mr. Pleskachevsky mentioned the birthday parcels that traditionally are presented to clients on their birthdays; these parcels usually include chocolates, oranges, and other gift items, but the cost of oranges has risen so much that this custom has become very burdensome financially for the hesed. Yet, clients still expect to receive oranges on their birthdays. Pensions are being delivered on time so far, Mr. Pleskachevsky averred. However, he is not confident that this practice will continue. "Who knows about next month?" he asked rhetorically. The hesed operates a day center program for its mobile elderly clients, dividing them into 22 groups of 30 people each according to the areas in which they reside. Participants engage in various social activities, celebrate holidays, arrange medical services in physicians' offices, and are served a midday dinner in a Menorah Center restaurant. They also may have their hair cut and receive other services. Special events are held in Menorah Center banquet halls and the Sinai Theater. Clients are transported between their homes and the Menorah Center by hesed vans. Groups usually attend the center three times during each two-month period, said Mr. Pleskachevsky. In addition to the large day center in Dnipropetrovsk, the hesed operates a smaller center serving 18 people in Dniprodzerzhinsk. Left: Day center clients gather in the large day room at Hesed Menachem. The group in the middle is dancing, the women in front are doing various kinds of handwork, and the men barely visible in the rear are playing chess. Art on the wall depicts symbols of the 12 tribes of Israel. 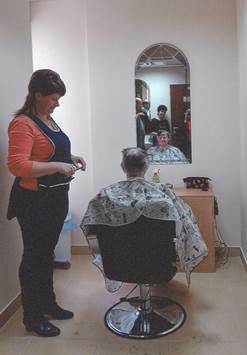 Right: Hairdressing services are available to day center clients. Veterans of World War II are honored in the hesed and elsewhere in the Jewish community. A major commemoration is held every year on Victory Day, which is marked in the post-Soviet states on May 9. The writer met briefly with retired Col. Solomon Flaks, age 87, who is the official "emissary" of Jewish World War II veterans in Dnipropetrovsk; Col. Flaks gives public lectures and appears on various television programs. He has been a hesed member for more than 20 years. Col. (Ret.) Solomon Flaks is well-known in Dne-propetrovsk as a representative of World War II Jewish war veterans. 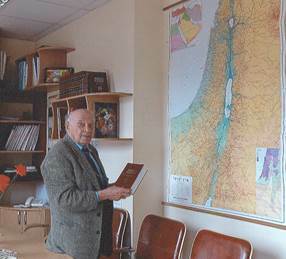 In a conference room adja-cent to the day center, he holds a volume of a post-Soviet book collection written to commemor-ate the wartime heroism of Jewish Red Army combatants; Soviet accounts usually ignored their achievements. 20. The Joint Distribution Committee also sponsors a Jewish Family Service that focuses on the needs of at-risk children and families. According to director Natasha Gusak, the JFS has 1,531 child clients, each of whom is at risk due to poor parenting, impoverishment, and/or disabilities. A modest daycare program attempts to prepare a small number of targeted children between the ages of 18 months and three years for successful entry into regular preschools (kindergartens); classes on parenting are held for their mothers. Some at-risk school-age youngsters are invited to regular JCC activities and limited tutoring is available to those who need assistance with school work. Material support in the form of food parcels and medicines is provided to some impoverished families. A related program is Mothers for a Better Future, which targets single parents in need of "psychological rehabilitation". Women are offered counseling, basic English and computer skills, workplace skills, and referrals to programs that might help them to become hairdressers, bookkeepers, or comparable specialists. The Tikvah special needs program enrolls 130 children, some of whom also attend the Special Needs Educational Resource Center at Beit Chana. Tikvah program components focus on speech and animal therapy, crafts work, and occasional swimming lessons. Some youngsters also receive massages. Thirty-seven families of children in this group receive financial aid, said Ms. Gusak. Three bedridden youngsters receive certain services at home. A major issue in dealing with special-needs youngsters in Ukraine, Ms. Gusak con-tinued, is parental denial that a child requires assistance. Parents may repudiate a diagnosis that their youngster has an autism spectrum disorder, for example, and simply keep a child at home after he/she has been expelled from a conventional public school for behavioral reasons. They do not seek support, perhaps because they are reluctant to acknowledge that their child is different, they are unaware of support programs, special education services are poorly developed, and/or such services have poor reputations or are costly. Families come to Tikvah through physician referrals, said Ms. Gusak, but then Tikvah must deal with reluctant parents. In response to parental issues, JFS has formed a parent support group. Individuals in the photo at left are par-ticipating in Yadid (Heb., Friend), a group for adults with developmental disabilities. Yadid organizes occasional recreation and social programs, some of which are held in conjunction with Jewish holidays. 21. Adopt-A-Bubbe/Adopt-A-Zayde is an independent assistance program created by Dr. Judith Patkin, the Executive Director of Action for Post-Soviet Jewry in Waltham, MA. 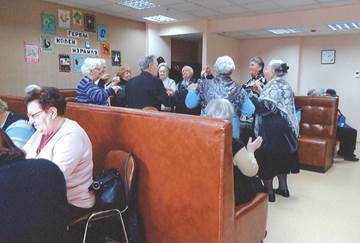 The Dnipropetrovsk organization supports elderly Jews in Dnipropetrovsk itself and in 18 additional cities or large towns and numerous smaller towns in eastern, central, and southern Ukraine. However, the total number of towns served has declined as Jewish populations in these villages have diminished to the point where service calls are economically prohibitive. At any given time, said Yan and Tanya Sidelkovsky, who direct AAB operations in the Dnipropetrovsk region, approximately 800 to 850 individuals are on their client list, a reduction of approximately 200 since 2013 due to financial constraints. Some clients are rotated in and out of their service census periodically in order to serve more people, Mrs. Sidelkovsky stated. The major form of AAB service is the distribution of general food parcels to a long list of needy Jews. The organization also provides food, clothing, and medicine tailored to the specific requirements of particular clients, such as food and medications for diabetics. Further, it assists patients in hospitals who usually must bring their own linens and medicines, as well as food, for their hospitalization. AAB provides medicines and medical supplies (such as catheters, syringes, and surgical instruments) to several hospitals, both as general assistance and as an incentive for hospitals to admit and treat AAB clients who require hospitalization. The client census was 7,500 in 2012 and 8,000 in both 2011 and 2010. Only those individuals who were victims of the Holocaust are eligible to receive Claims Conference funding. Obviously, many such individuals die each year. See also page 60. The two principals of PrivatBank are Hennady Boholubov and Ihor Kolomoisky, both of whom are major donors to Jewish philanthropy. Mr. Kolomoisky also is governor of Dnipropetrovsk oblast. PrivatBank generally is considered the most sophisticated bank in Ukraine. Customers also can pay utility bills through bank terminals and, Mr. Pleskachevsky observed, make tzedekah contributions at these stations. PrivatBank offers a discount to hesed clients and has placed a bank terminal in the hesed for their use; the terminal is quite popular with clients, Mr. Pleskachevsky said. Agro-Joint established agricultural colonies and industrial schools in Ukraine and Crimea with the active collaboration of Soviet authorities. However, the Soviet Union expelled foreign groups in 1938, causing many Agro-Joint institutions to collapse. Many displaced farmers moved to urban areas at that time, while a relatively small number remained on settlements or in nearby villages. A large proportion of former Agro-Joint workers were killed during the Holocaust. As mentioned earlier, some hesed clients elect to learn computer skills in an information technology center operated by the Hillel student group. See page 24 in this report. See pages 20-22. The Resource Center program is more comprehensive and focuses more on education, whereas the Tikvah program is more social and recreational in character. The issue of parental denial of child disabilities is widespread throughout Ukraine. See also pages 59-61 for an interview with Yoni Leifer, who directs all Joint Distribution Committee operations in the region. The program also operates in several other regions of the former Soviet states. However, this report deals only with work that is directed from its Dnipropetrovsk office. In addition to assisting Jews, Adopt-A-Bubbe also reaches out to elderly Righteous Gentiles, i.e., those from families who helped Jews during the Holocaust.